Superbe maison familiale au bord de l'eau avec 4 chambres, piscine chauffée, cette maison exécutive au mobilier de qualité est située dans un environnement de palmiers tropicaux et est située sur un canal en eau profonde à Siesta Isle, une petite communauté privée sans circulation, idéale pour la plage avec un accès facile en ville pendant la haute saison occupée, un grand quartier de la navigation de plaisance, à proximité des plages de sable fin, à seulement quelques minutes du golfe, environ 2800 pieds carrés, la maison dispose de 4 chambres à coucher, (deux roi, une reine, une complète) deux salles de bains. Téléviseur UHD intelligent et forfait télé amélioré, Internet 80 Mbps. La maison peut accueillir confortablement de 4 à 8 personnes et son prix est adapté aux saisons hautes et basses. Voir la section ci-dessous et les tarifs pour plus d'informations. Le salon principal a des portes françaises comme le font deux des chambres ouvrant sur un 1000sq ft dépistage lania surplombant la piscine et plus, idéal pour les repas du soir douces ou simplement regarder les magnifiques couchers de soleil. Superbe piscine, un quai de 1500 pieds carrés idéal pour la pêche ou regarder le lamantin et les dauphins nager acheter, location de bateaux disponibles à seulement quelques minutes à l'un des nombreux ports de plaisance, de nombreux restaurants, golf d'aventure, "Sanibel" concepteurs points, sont tous à proximité 10 minutes à Sanibel & Captiva, à 25 minutes de l'aéroport. Il ya un grand parking pour 3 voitures. Venez vivre la magie de la plage de Myers, vous ne voudrez plus partir. We loved the location, neighborhood and the pool! The screened porch is very nice. There were a few things about the house that could use a little updating. But, overall, the positives made for a great experience. We love Ft Myers Beach! Lots of space. Appreciate the different levels so the teenagers could have their own area. Loved the large, screened porch. It was nice seeing dolphins in the canal. Pool was cool the first couple of days, but once it was adjusted, it was a warm 87 and perfect for swimming. We are delighted you enjoyed our home. you were the perfect guests, hope to see you again in the future. Loved the outdoor pool area! Our family traveled to the area for a quiet getaway. This house is located in a quiet neighborhood that is close to the beaches, just a short drive over the bridge. The outdoor area is excellent with a pool and a small fishing dock. Manatees swim around the dock at times, they were fun to watch. The house has linens, bath towels and towels for the pool. We would definitely stay at this house again. This home was a fabulous getaway for our family. The house felt like a home. This home was in a perfect location for us and provided us everything we needed. When we wanted to enjoy beach life, it was a short ride in the car or a bike ride for the teenagers over the bridge. We relaxed daily by the pool watching the manatee and dolphins swim and our kids fished nightly at the doc. There were so many things to do in the area and the quiet neighborhood was a peaceful retreat after a day full of activities. The house was clean, well maintained, stocked with everything for cooking and grilling and most importantly the beds were comfortable. This home away from home far exceeded our expectations! Clean and sparkly, classy and ecclectic. It was a quiet, exclusive area that resonated all Florida has to offer. 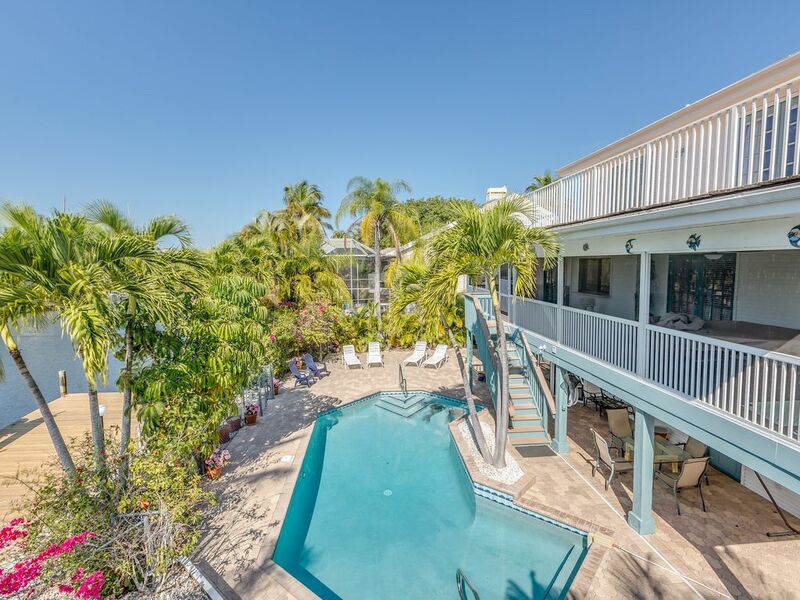 Palm trees and flowering greenery accented the scenic poolside view of the canal, where boating neighbors waved as they passed in front of lovely homes. Our family had all the space and luxury we needed for an unforgettable vacation. We thank you for your review and glad you enjoyed our home and the surroundings.